Amalia May recommends three wonderful mountain retreats, ideal for winter getaways! 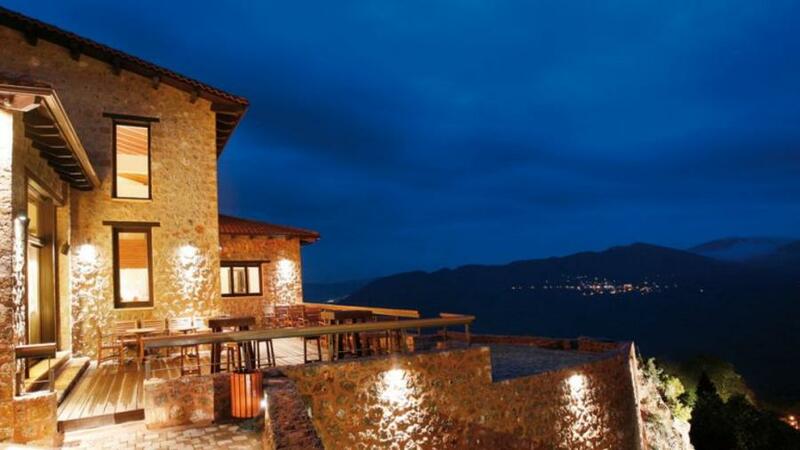 One of the best mountain hotels in Greece is in Kato Trikala Korinthias, which in recent years has become a popular winter destination due its proximity to the capital. Pliadon Gi will instantly impress you with its beautiful design and its 20 fully equipped suites. The communal areas put you in the mood to relax and they’re very tastefully decorated (see photo). There is a particularly impressive spa with a heated pool, steam room and hydro massage as well as a beautiful restaurant with Greek and international dishes. A stone’s throw from the most cosmopolitan Greek winter resort, the well known architectural practice ISV has created a very impressive hotel complex combining modern building practices and traditional materials. The welcome you’ll receive as well as the views are the two things you’ll never forget. There are five luxurious apartment-suites with king size beds, designer furniture and lighting fixtures, plasma TVs and jacuzzis. The superior suites also have a fireplace. The tailor made service model make this place extra special. Valia Nosta Escape Hotel is located a mere 6 kilometres from Vasilitsa ski resort and has quickly established itself in the Grevena area. There are 5 rooms and 8 suites, all decorated in an understated but luxurious style. There is a rich breakfast buffet and a chance to explore the nature around it, including some skiing time. For the less active among you, there is a great spa and an indoor heated pool with a view of the woods, a steam room, gym, sauna and hydro massage pool.